Refund Policy - Custom sports posters, personalized team collages, senior banners, and team schedules for your athlete! Refund Policy - Custom sports posters, personalized team collages, senior banners, and team schedules for your athlete! All sales are final. 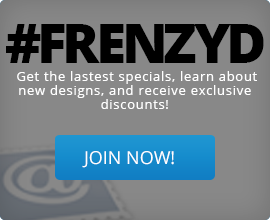 Once you have completed your order through our shopping cart system at Frenzy-Designs.com, you will be charged in full to the specified payment source. In some cases, you may be able to receive a partial refund, less than the work already completed billed at $25 an hour. Frenzy-Designs.com urges you to notify us as soon as possible regarding any cancellation requests. Due to the custom nature of each design and because each item is unique to that player/team, it requires a dedicated amount of production time and is an original item that can’t be restocked or resold. Work begins on an order immediately once the order is received, but there are various stages in the workflow process. If the initial proof has already been completed, no refunds will be granted. Please note that any information or timeframes provided regarding Normal Proofing is only an estimate and can change to be sooner or later based on the expedited orders and production demand, especially during our peak seasons. We are only able to guarantee our expediting proofing services. Any time you need your items by a definite date, we would highly recommend using our expedited services to help meet that date. Expedited orders do proceed any normal proofing orders. Please note that day 1 starts 24 hours after we receive the order and files. Business days do not include the weekend or holidays. Please remember that our primary support is via email to team@frenzy-designs.com, because it helps us keep our pricing competitive by reducing the overhead costs of a full time phone support staff and system. If you feel you need to speak to someone, then we are happy to schedule a call to assist you further with questions. In cases of refunds or cancellations, it may take up to 10 business days for a credit to be issued. For billing related questions, please feel free to call us. Occasionally, there may be a need for a reprint an order. Although we cannot grant all requests, we do our best to meet our customers’ expectations. Below you will find specific information on different scenarios that require special attention. 18 x 24 sized posters are printed on 80# Gloss Cover. Printed image area is 17″ x 23″, while the trimmed poster size is 18″ x 24″. Prints include a 1/2″ white border around all sides of printed posters. No substitutions can be made. We do not recommend using these in outdoor areas. The vinyl material (14 oz. high tenacity polyester vinyl banner) & fabric material (270 gsm / 8 oz wrinkle resistant tension cloth fabric) used has exceeded the minimum requirements of the flame resistance established by the following tests : National Fire Protection Association (NFPA) 701 test result for Vinyl and Fabric. The material has been treated with a flame-retardant chemical or are inherently noninflammable. The fabric products are 100% eco-friendly. Banners are water and UV resistant, include grommets (every 2′ – 3′), and are double stitched or weld hemming. For vinyl banner usage, we do not recommend trying to store and reuse the items. The rolling, folding, packing, and storing can put them at risk to cause damage to the banner and/or the print area. If your items were damaged due to shipping, we will resend the prints to you immediately. We only ask that you email team@frenzy-designs.com letting us know and by sending a picture of the damaged package to files@frenzy-designs.com. Our shipping carriers require this at the time we file a claim with them. We also ask that you inform us of damages, missing items, or wrong items within 5 business days of receiving your order. Not all computer monitors are the same and this represents one of the fundamental problems with color “matching”. Even if your monitor is “calibrated”, it may still be showing higher levels of one color or another. Light represents color much differently than reflective material. When viewing color on a screen, it is represented in RGB, whereas printed material is made up of 4 colors – CMYK. The difference can be drastic. RGB shows colors that cannot be printed. Some colors, such as bright colors and neons, can be represented on a computer screen, but cannot be printed. The best way to see a “preview” of your image is to convert it to CMYK colorspace before you send it to print. Because of many factors such as environmental humidity, paper humidity, current settings, paper variances, consumable characteristics it’s impossible to have exactly consistent print results for every press run. Therefore, we consider a 5% variance in color to be acceptable and cannot reprint based on these slight differences. However, if there are printing defects with your poster, upon inspection we may grant a reprint. We can provide feedback on files, when requested before the initial proof, to let you, the customer, determine the printability of your image. We hold no responsibility for poor results from low resolution files. This includes files that have been intentionally “rezed up” – arbitrarily increasing the resolution of an image.